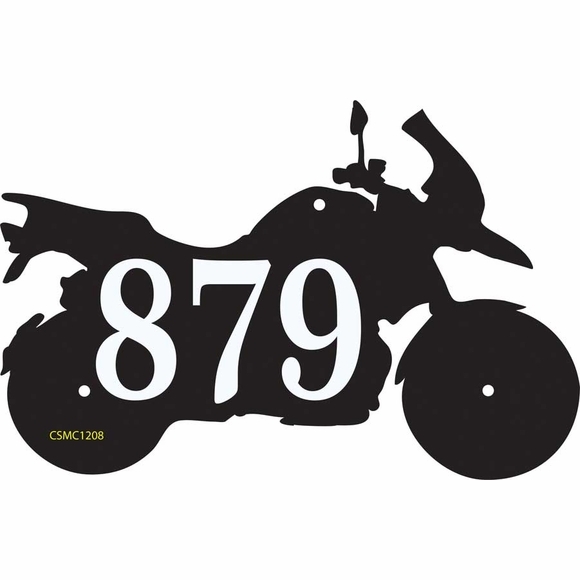 Motorcycle Shape Address Plaque - - silhouette motorcycle shape address plaque is approximately 12"W x 8"H x 1/8". Made in the USA. Holds address with up to three (3) 3" characters. Style number visible on sample sign is for internal use only and is not on your custom sign. Style number visible on sample signs (CSMC1208) is for internal use only and is not on your custom sign. Dimensions (approximate): 12"W x 8"H x 1/8". Motorcycle Shape Address Plaque made from sturdy and UV-stabilized, non rusting, laminated acrylic plastic. Engraved personalization. Made in the USA.